It was a rainy Sunday morning while my aunt visited us with a container of this hot payasam.I was in Kottayam nursing mom, then. Hope you had a wonderful Onam. Belated Greetings to you all! I know I am a little late to post this delicacy, which I meant to post for the day. They say; better late than never! Fry the whole green gram in a hot pan. Cook the gram in 4 cups (more or less) of boiling water. In the meanwhile, boil and melt jaggery in 1/4 cup of water in a sauce pan. Cool and strain so as to remove the impurities. Keep aside. When the gram has cooked soft, add the above jaggery syrup. Simmer the mixture until it turns thicker stirring all the while taking care not to burn the bottom. Remove from fire and mix in the coconut milk. Add the coconut pieces and cashew nuts. Bring it to a slow boil and turn off immediately not to let it simmer.Stir in the cardamom powder. 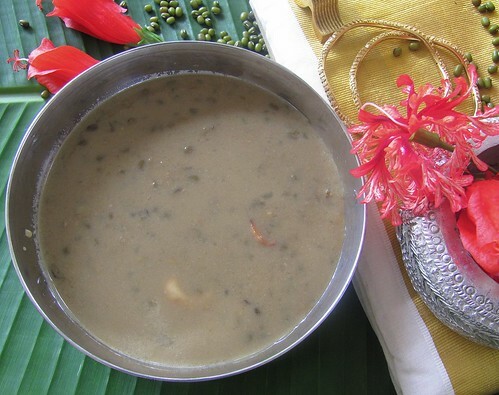 Serve warm Cherupayar Payasam with Onasadya. Forgot to say love the pic. Parkka Super a irukku! flowers, saree, ellam grand look kodukkuthu. Nice Pics!! Ya me too second lavi,the props makes the dish look more rich and divinely!Super click Bharathy! 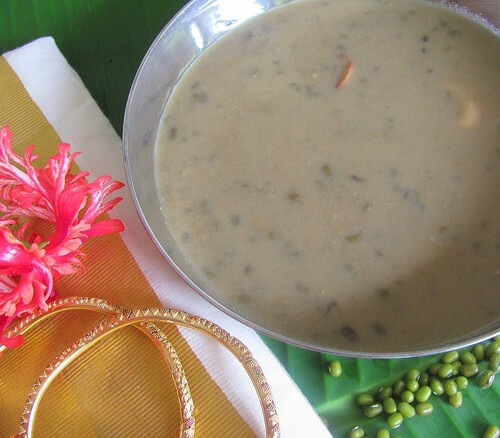 I love this payasam very much for its texture and flavor! 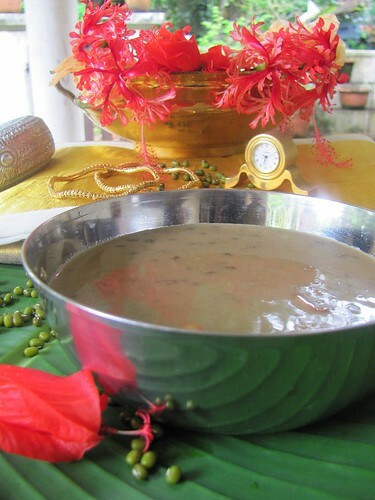 Cheru payar payasam is something new to me..I always make it with moong dal,but not with whole moong! !Looks drool worthy! !Belated Onam wishes to you!! payasam looks simply awesome.. beautiful presentation.. thanks for sharing !! Payasam with cherupayar is new to me. I always make with the paruppu. I will surely remember to try it with payar next time. I am not a big fan of this payasam, but absolutely love your pic. Beautiful click, payasam looks super delicious..
pinne hindu contest pic onnu forward cheyoo..
u know what, this is my most fave payasam.....even thoiugh it gives me some nasty troubles!u made me drool bjharathy! Thank you for visiting my blog and for a lovely comment Bharathy. This healthy payasam looks so yummy. Love your space too. I've never had this type of payasam...sounds very unique and tasty.